Here's the door, Vito, it's time to go. Good luck in the private sector. As if Congressional Republicans don't face enough bad news heading their way this fall, they now have a growing mess on their hands with Vito Fossella, the lone representative from New York City. 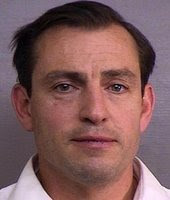 Fossella last week was busted driving drunk in Virginia, and that may be the least of his troubles. Embattled Staten Island Rep. Vito Fossella isn't saying whether he fathered a love child - but his alleged gal pal is doing enough talking for the both of them. Shapely former Air Force Col. Laura Fay has been frantically phoning friends and relatives, urging them not to talk to the media about the identity of her baby's daddy, a relative told The Post yesterday. Fay's flurry of calls is designed to shore up a wall of silence since details of her relationship with Fossella emerged when she curiously signed him out of jail after his arrest for drunk driving in Alexandria, Va. last Thursday, the relative said. When he was stopped, "the subject stated that he was driving down from Washington D.C. to Grimm St. because his daughter was sick and needed to go to the hospital," the police report said. Fay lives on Grimm Drive. Meanwhile, Fossella also has made several hush-hush phone calls to top-level Republican Party officials on Staten Island to gauge their support amid the swirling scandal, other sources said yesterday. Fay, 45, has been refusing to talk publicly about her relationship with Fossella, and the relative - who spoke on condition of anonymity - says she has always been cagey about who fathered her toddler daughter. Fossella - who has three children with his wife of 18 years - has not denied the rumors. His spokeswoman has only angrily declined to comment, calling such questions "highly inappropriate." No, his behavior, his judgment, his concern for his family, that's what's highly inappropriate. The GOP, be it the Staten Island branch or what remains of it in DC, needs to send Fossella packing. Now. The Democrats, you can bet every last nickel, will eagerly wrap this around their necks like a millstone. And do you really need another sleazy member in your midst in the wake of other scandals from the not-too-distant past? We all revel with glee at the demise of Eliot Spitzer, Jim McGreevey and other assorted Democrats done in politically by their sexual peccadilloes. We can't be hypocrites and look the other way when it's a Republican exercising incredibly bad judgment. So, there's the bad news. The good news, you ask? Well, just consider the delicious specter of having New York City's wackiest Councilman elevated to the national stage, and all the innovative legislative possibilities that may entail. Sources said party officials have privately discussed who could best hold onto the seat for the GOP should Fossella end up in deeper trouble. Names being bandied about include Staten Island DA Daniel Donovan and city Councilman James Oddo. Uh, Sir, Exactly How Did Those Washers Get There? What Do You Expect on the Island of Kos? HOW WE CAN DEFEAT AL QUEDA! So, Islam Is a Race Now?